Walking down Rambla Catalunya street there are several terraces that are perfect to have some beers while you contemplate the wonderful architecture of art nouveau buildings and why not of some sculptural bodies especially in this time of year. But let's leave the female topic aside cause I digress. Well, you sit there and ask the waiter for a drink and perhaps a Spanish tapa. Man, I don't know if your budget can afford that but we absolutely try to avoid such places. I reckon they are comfortable and with a view but I can assure you that there are a handful of excellent places some blocks away for half the money and much better food. But go ahead, when you are a tourist you have to play the part; they tell you, and in spite of that, you go and squander your money. What the heck!, you say, these are my holidays. I understand I've done the same in Paris or in London. My advice, you try it but just once. Then mix up with locals they know better. 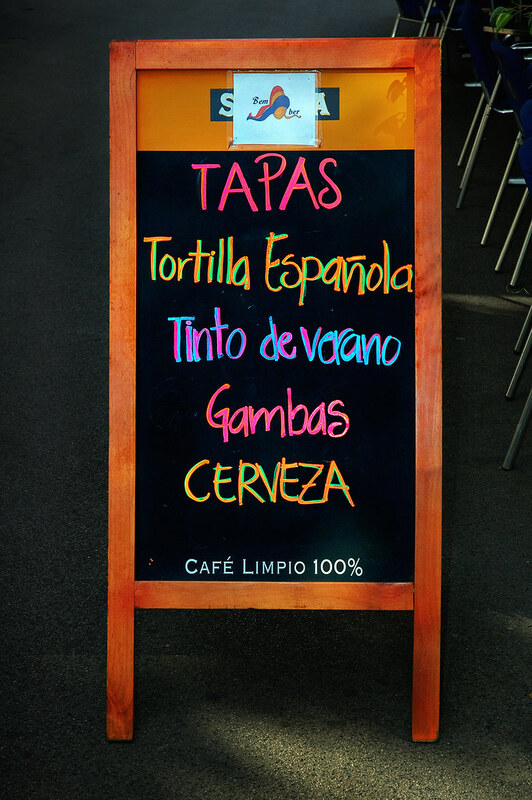 Check that board again: tapas (which ones? there are hundreds!) and then Spanish omelette as the bait (isn't that a tapa). Tinto de Verano (literally, summer red wine), a mixture of cheap wine with Casera, a brand similar to Sprite. The drink is lighter than Sangria and more refreshing. Here is a Tinto de Verano recipe. Gambas are shrimps, hmm that's good but certainly you have them cheaper and tastier some other place. And beer, well, that you know. You have several words to ask for a beer according to the kind of glass or cup. You can order a caña (the smallest), a copa (a cup), a tubo (high and cylindrical glass) or a jarra (a jar). Then you have the bottle measure: the small bottle called quinto and the normal size "medianas" (tercios in other regions of Spain). I hope this odd mixture of Spanish food, tourism and bad reviews is at least helpful. La tortilla española, de los mejores platos ke he probado en Barcelona. This post reminds me of all those sweaty tourists on La Rambla drinking warm 64-ounce beer on the terraces. My first thought is, why?? Like you said, just a few blocks away are wonderful little places that are cheap, delicious and deliver an experience a thousand times better.